The work of the West Haven Wastewater Pollution Control Facility is vital to the city of West Haven, Connecticut, a seacoast community with a view of Long Island Sound featuring beaches and a boardwalk. It services approximately 55,000 residences in West Haven and a portion of the neighboring town of Orange. After a decade-long relationship with an independent municipal wastewater management firm, the city of West Haven resumed operation of its 12.5 million gallons per day (mgd) water pollution control plant (WPCP). The WPCP team immediately began to review their current processes to recognize target areas for improvement. The goal was focused on identifying ways to increase equipment reliability, general efficiencies and promoting operator safety while trying to reduce operational costs and the environmental impact to New Haven Harbor. Some of the processes targeted were in the plant’s three polymer activation systems. Polymer is used to coagulate suspended solids and aid in the dewatering process of active sludge. Emulsion polymer, also known as liquid polymer, requires an activation process that disperses the right amount of energy to allow for the polymer chain to maximize to its full potential. Polymers are long chained molecules that attract suspended particles, thereby forming larger solids that can be easily removed during the dewatering process. Polymers are normally shipped in a concentrated oil or surfactant-based solution. Emulsions normally contain oil or surfactant and up to 35 percent active polymer. One disadvantage of emulsion polymer is that the oil or surfactant needs to be stripped away, allowing the polymer molecule to hydrate. Hydration allows the polymer chain to uncoil itself and fully extend. It is at this point of full extension that a polymer is most effective, but also susceptible to damage. The energy needed to remove the oil and surfactant can also damage the polymer chain once fully extended. This balance and complexity makes an advanced emulsion polymer activation technology beneficial. Many polymer activation systems do not provide enough energy at the earliest point of hydration or provide too much energy once fully extended. Both cases reduce the effectiveness of the polymer, which ultimately requires increasing polymer usage and the cost associated with its increased use. Image 2. The activation chamber ensures that activation level remains adequate. The West Haven Wastewater Pollution Control Facility dewaters activated sludge through three belt filter presses and uses liquid emulsion polymer to assist in the dewatering process of bio-solids. The original polymer systems were not intuitive and had no ability to interface with the operators. The units in general had limited control functions other than pump speed adjustment. The final straw for operators was the continued increase use of polymer to obtain the desired results the plant needed to run correctly. Previous systems used by West Haven were designed using a hydromechanical mixing device, which isolates agitation energy in zones. These systems use the same rotational speed while applying different mixer impeller blade geometries to reduce energy per zone. High energy mixing removes oil and surfactant. Light agitation then helps the polymer chain uncoil. Since these systems use a fixed speed device, they have no means to compensate or self-adjust in a real-world environment. This is particularly true when inlet dilution water flow or pressures fluctuate. These fluctuations do not allow the mixer geometries to deliver the right amount of energy needed to activate polymer correctly. One way users can determine that a polymer system is not working properly is the identification of agglomeration in the active polymer solution. Agglomeration is an indication of wasted undissolved polymer. The larger the size of the agglomeration the more significant the negative financial impact stemming from a poorly functioning system. Image 3. Progressive cavity pump with rotor and stator (Image courtesy of Netzsch). Proven technologies are capable of compensating for flow or pressure fluctuations, while generating ultra- high activation energy and exposing this energy once at the earliest point in hydration. Systems incorporating hydrodynamic principals deliver reliability, ease-of-use and the opportunity to maximize polymer to its full potential see reduced polymer use and significant annual savings. A process equipment firm developed a polymer activation system with an offering of liquid and dry polymer feed systems, designed to tackle the need to deliver an advanced technology aimed at maximizing polymer activation. 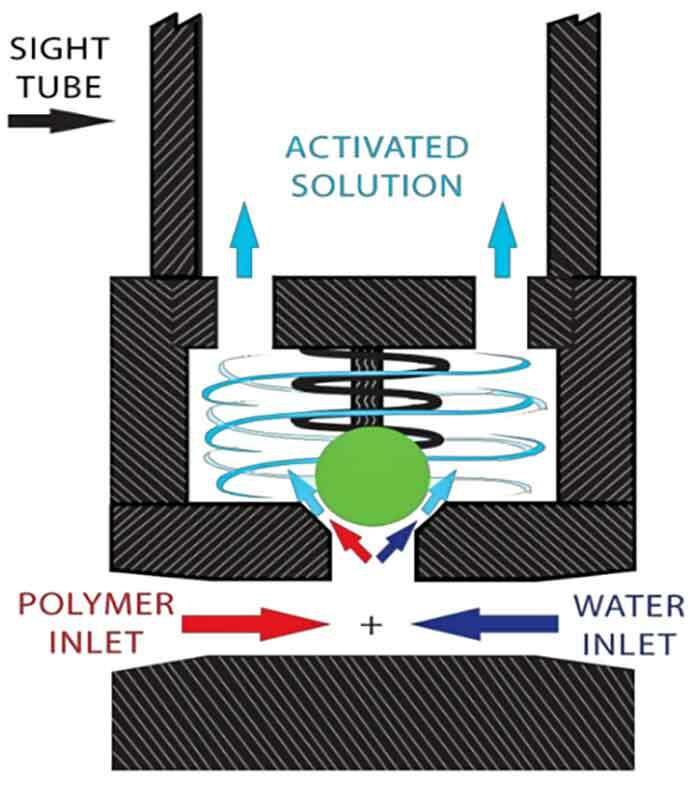 The polymer activation system activates polymers through a motor-less, hydrodynamic, high-energy activation chamber. 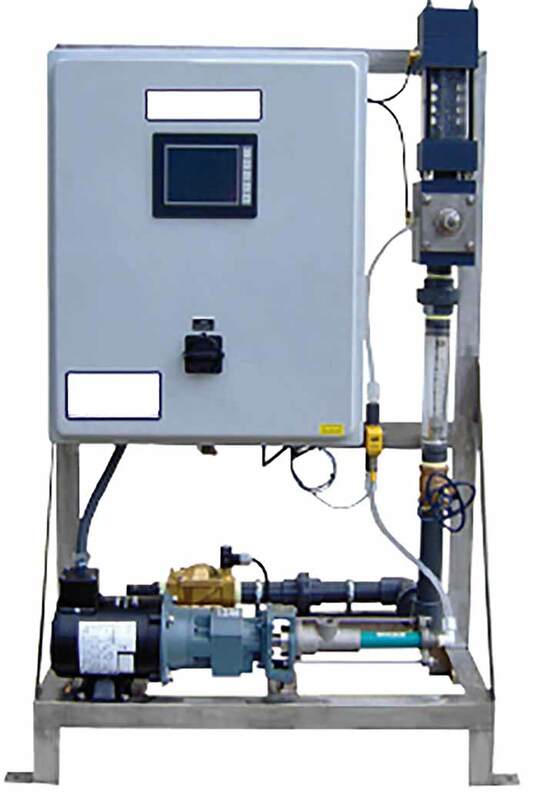 The chamber uses the energy available in the dilution water flow to activate all types of liquid polymer.